In this quote, Nestor explains two types of perceptual changes: the “microscopic” vision and the “macroscopic” vision. In his theory of seeing, we can see objects smaller, sharper and more “intense” (“microscopic” vision) if we concentrate on a closer layer of consciousness, or draw the focus closer, respectively. In this case, the same energy amount of that image is condensed on a closer and smaller space in the visual field, leading to the said perceptual effect (News 3/13). In contrast, to see an object bigger and more detailed (“macroscopic” vision), we have to increase the amount of energy somehow. On the outer screen, this means that we have to draw the object closer to us, approach it or look at it through binoculars. In all these cases, we invest additional energy, physically or industrially. This theory corresponds to the seers’ idea about the two levels of intensification of consciousness: Through concentrative practices, psychophysiological energy is condensed and thus can be experienced and seen directly. Although the image gets intensified, the layers of consciousness are not penetrated yet – the mystical entering into the picture or in the “source” is not possible that way. This becomes possible, if we collect additional energy, let it circulate in our body and give it as ecstasy into the picture as a whole (News 1/13). As a result, the seer flies through the layers of consciousness, approaches his or her shining spheres and strings and becomes one with his or her source eventually (News 2/12). 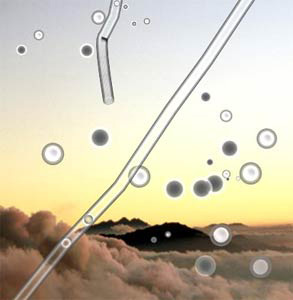 - Tausin, Floco (2010): Eye Floaters: Floating spheres and strings in a seer’s view. In: Holistic Vision 2. www.eye-floaters.info (27.5.14). 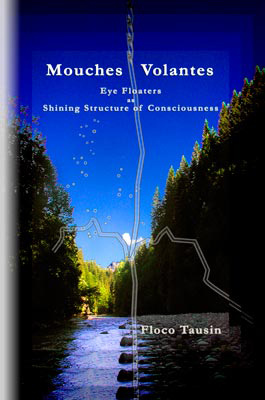 - Tausin, Floco (2009): Mouches Volantes - Eye Floaters as Shining Structure of Consciousness. Bern: Leuchtstruktur Verlag. My new English website www.eye-floaters.info is online. The site is reorganized and optimized for new web technology and mobile devices. Come and have a look! The work Chymical Wedding, by Christian Rosencreutz, 1459, written by Johann Valentin Andreae, was released in 1616. It is a document of the so-called „Rosicrucians“, a collective term designating several factual or fictive brotherhoods and secret societies of the early 17th century Europe. The old Rosicrucian manifestoes are fantastical works filled with references to contemporary religious and esoteric traditions and the burgeoning modern sciences. They combine Judeo-Christian, alchemistic, hermetic and cabbalistic speculations, as well as social criticism and Reformation ideals. In Chymical Wedding, narrator Christian Rosencreutz tells about a seven day period in which he witnessed mysterious events happening in a fictional place. He and other chosen scholars attend a complex procedure in which three royal couples are decapitated, their remains chemically dissolved and their essences brought to life in a newly created king and queen. Two half circles, a cross, a dotted circle and a crescent moon – the sign on the wedding invitation for Christian Rosencreutz. It combines several contemporary meanings: It’s the Hieroglyphic Monad of John Dee (1527-1609), the astrological symbol for the planet Mercury in Aries, the alchemical symbols for vitriol (a sulfate) and Mercury as the source of life; furthermore, it is the emblem of physician Paracelsus (ca. 1493-1541) and Hermes Trismegistos, the fictional author of the Corpus Hermeticum. Is the Chymical Wedding referring to entoptic imagery, as Werner suggests? That’s possible since the work is, among other things, a description of a process of fragmentation, transformation and revival of human bodies, reminding of old shamanic initiation rituals (Tausin 2012). That means that the chemical wedding might be a metaphor for an ecstasy practice and the intensification of consciousness, similar to the „path in the shining structure“, as the Emmental seers call it. Indeed, several motifs in the text refer to abstract forms which possibly symbolize the layers of consciousness and the spheres and strings of the shining structure: The alchemical procedure takes place in a seven-storey tower, each step of the process is performed on the next higher floor. Mounting up the floors is only possible by using „ropes“, „ladders“ and „wings“. The dead bodies of the decapitated royal couples are dissolved by a fluid flowing through „pipes“; the essence is collected in a „golden globe“, which is heated on the next floor and then reveals a „lovely great snow-white egg“. A bird hatches out of this egg, and the scholars feed, decapitate and burn it. From the ashes, they build two small human forms (Homunculi), feed them with the blood of the bird and let them grow to full-sized man and woman. From a “hole at the top open”, a “bright stream of fire shooting down the tube” and passes into the bodies. That way, the new king and the new queen are animated and revived. It is conceivable that the three royal couples symbolize the floater spheres or the shining structure that are filled with worldly matters at first and have to be purified and thus lighted up in the alchemical procedure. Or, the royal couple are the seers who, during a temporary intense act of seeing, invest energy in the shining structure or the „ropes“, „ladders“ and wings“ respectively, to penetrate the „floors of the tower“ or the several layers of consciousness, dissolve their personalities, experience themselves as freely flowing energy or „essence“ in the „globes“, „pipes“ and „tubes“ of the shining structure, and then return as purified individuals, conscious about their connection to the picture as a whole. Thanks, Werner, for that tip! Eye floaters are a source of inspiration, not only for authors and painters, but also for musicians. In my German newsletters, I have already presented the Norwegian project “Mouches Volantes” and the Dutch “laptop + video performance” group “Mouches Volantes” in my German newsletter (News November 2006; News 2/08). In this newsletter, let’s turn to the U.S., namely Bowling Green in Ohio. Here, Hugo Martinez pleases his audience by conjuring relaxing and mystical sounds on his guitar. One track of the digital album “Amalgamation” is “Muscae Volitatantes” or “Muscae Volitantes” – the spelling varies, and it is unclear if it is an error or artistic freedom. The music, however, speaks for itself: The first part of this short and nice Ambient piece consists of riffs, executed with delay and reverb effects. In the second and shorter part, this flow is given up in favor of some mystic chords which eventually dissolve in total silence – the gentle reader recognizes the parallel to the reductive “path in the shining structure”. On Youtube, my image “Eye Floaters” is taken as the cover image for “Muscae Volitatanes” and was done up to look like “old films” – or visual snow, respectively. This “entoptic image noise” perfectly emphasizes the musical dynamic. Enjoy! This psychological study by Jared R. Lindahl and colleagues examines the subjective visual light phenomena which are perceived by experienced meditators. 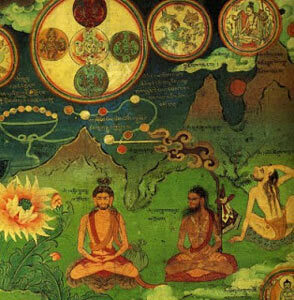 The authors compare these phenomena to descriptions of lightforms in traditional Buddhist texts, but also with neurobiologically researched light experiences. 28 meditators have been interviewed who regularly practice meditation in a Buddhist tradition – US-American Vipassana, Asian Theravada, Tibetan Buddhism and Zen Buddhism – and had a meditation-related “significant” or “unexpected” experience. One third of the respondents reported light experiences. These were classified by the authors in 1) discrete lightforms, often described as rather small, vivid and distinct white or colored globes, jewels, lights or spots, either singular or multiple in number, stable or animated; and 2) patterned and diffuse lights, often described as shimmering, pixelation or brightening not having a distinct shape, size, color or spatial location. According to Lindahl et al., there are equivalents for both types of light experiences in the traditional Buddhist literature. These are expressed partly in descriptive terms and partly in metaphors of nature and symbolic terms, e.g. luminous spheres, cluster of pearls or gems, stars, moon’s or sun’s disk, flickering fireflies, grids, stretched-out cobweb, glow of a butter lamp, clear autumn sky pervaded by the full moon light, to name just a few. These lights are interpreted differently by different authors and traditions. Sometimes, they indicate that a certain stage of concentration or development is reached; at other times, the lights are understood as a result of imbalanced practice or as “imperfections” because they can lead the meditator astray from meditation; some authors interpret the lights as a vehicle for investigating the constructed nature of all phenomena, while others deem light experiences an unimportant side effect of meditation. The authors also compare the light experiences to physiologically researched “simple visual hallucinations” which are induced by sensory deprivation, perceptual isolation and disorders of the visual system (Charles Bonnet syndrome). These hallucinations can be distinguished the same way as the meditation-induced lights, i.e. in discrete lightforms like colored spots or dots of light and flashes of light (phosphenes and photopsia), and patterned and diffuse phenomena like lattices, grids, cobwebs, branching forms, zigzag patterns, visual snow, as well as general brightening, shimmering and mist or fog, among others. These light experiences are neurobiologically explained as an effect of the homeostatic plasticity, a mechanism by which neurons regulate their intrinsic excitability in order to maintain stable activity and firing rates: When sensory inputs are attenuated or deprived, this decrease is compensated by an increase of neuronal excitability. Neurons switch to more frequent and spontaneous firing which is experienced subjectively as light hallucinations. Since Buddhist meditation practices often take place in social isolation or in groups with minimal social interaction; and since meditation means to restrict attention to monotonous, homogenous or repetitive stimuli, the authors understand the meditation-induced light experiences to be a result of that sensory attenuation or deprivation. Furthermore, sensory attenuation increases neuroplasticity – i.e. the adaption of the neuronal system to behavioral, environmental or physiological changes; therefore, the authors suggest that the meditation-induced light experience indicate periods of enhanced neuroplasticity in which cognitive and therapeutic processes are facilitated. Finally, the authors propose to further study the entoptic light phenomena in order to measure meditative proficiency or expertise. 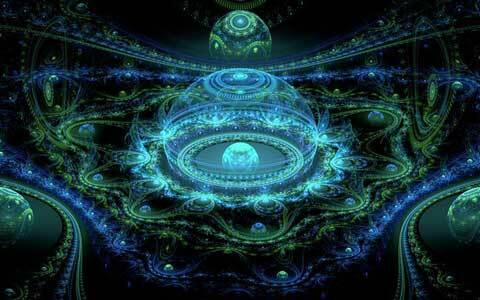 Subjective visual light phenomena are studied best by observing them during different states of consciousness. However, as soon as we start thinking about them, it is rewarding to understand what different cultures and systems of meaning and knowledge have to contribute, in order to get a more complete picture. The study by Jared R. Lindahl and his team works in that direction. The authors take entoptic phenomena seriously as an effect of a spiritual practice, locate them in a concrete religious tradition, but also go beyond that and compare them to physiologically researched light phenomena. The study reveals some parallels between Buddhist meditation and the practice of consciousness intensification in the seers’ sense: both take entoptic light phenomena as meditation objects and understand them as indications of a certain meditative expertise. This also shows that entoptic phenomena can be intensified not only through ecstatic (shamanistic) practices (Tausin 2010, 2012), but also through practices of calm and focused attention or meditation; whether this leads to the penetration of the layers of consciousness, to the “zoom-effect”, to “macroscopic” seeing and, eventually, to entering the picture as a whole, is unclear to me and requires further investigation. From a neurological perspective, a relationship between light experiences and enhanced neuroplasticity is established: Seeing entoptic phenomena goes along with increased receptiveness and openness for processes of learning, insight and healing. This is also claimed by the seers as a side effect of the “path in the shining structure”. Eye floaters are not mentioned in that study. That’s comprehensible since in physiology, floaters are still deemed vitreous opacities and not understood in neurological terms (Tausin 2011). 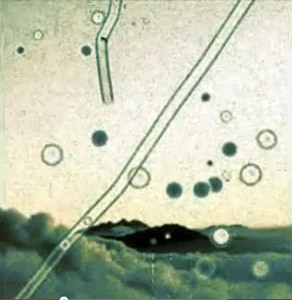 However, the light phenomena descriptions by both meditators and Buddhist literature contain “discreet lightforms” that point to floaters, most likely the “white or luminous spots or spheres”, the “clusters of pearls or gems” and the “moon’s or sun’s disks”. Finally, this study is another clue for the growing awareness of the individual, cultural and spiritual meaning of entoptic phenomena. Thank you, Jackson Peterson (www.wayoflight.net), for that hint! Thanks, James and Joanna. I appreciate your thoughts and feelings on this project!